Alfonso Gomez-Rejon directs this sequel to the 1976 film of the same name. 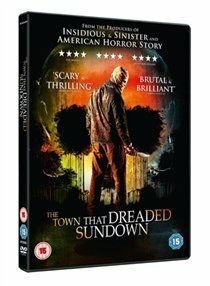 66 years after the town of Texarkana was hit by a series of unexplained murders by a suspect known only as The Phantom, the small town is having its annual drive-in screening of the film 'The Town That Dreaded Sundown'. While watching the film, teenagers Jami (Addison Timlin) and Corey (Spencer Treat Clark) realise they could be having more fun on their own. As they drive to a secluded area and start to get intimate, Jami spots a mysterious figure lurking outside the car window. After witnessing Corey's brutal murder, Jami recounts her story to the town's police who fear they have a copycat murderer on their hands. Is it simply an impressionable person admiring the work of The Phantom or could there be more to this reappearance of the infamous killer?